Today you’re going to enjoy an outback safari-style adventure. 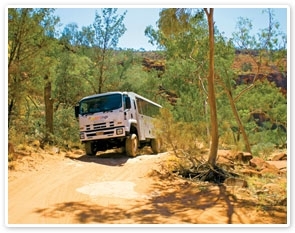 Travelling in our customdesigned 4WD vehicle, you’ll reach off-road destinations that are otherwise difficult to access. Through the Central Australian landscape we’ll take you down the very edge of Finke River and into the amazing Palm Valley. 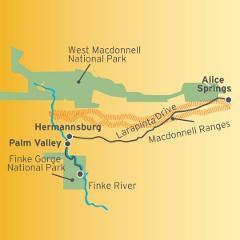 On the way to Palm Valley we’ll be right on time to see the Amphitheatre at its best. Also known as Kalarranga, this impressive group of red sandstone formations is particularly striking as the sun rises, leaving a glow of amazing light and colour across the landscape. Aptly named, as it is the only area in Central Australia where red cabbage palms survive, Palm Valley is an incredible outback oasis. Despite the harsh conditions, the gorge is supported by small pockets of spring-fed pools that ensure the survival of a diverse range of plant species. From the 4WD and on foot, you’ll be amazed by the enormous rock formations, pinnacles, gorges and endless palm trees in the area. Sit back and relax as you enjoy a picnic lunch in the Finke Gorge National Park. Covering a staggering area of 46,000 hectares, it’s noted for its ancient palms. The Park holds great cultural significance to the Arrernte people and there is also evidence of early European settlement.